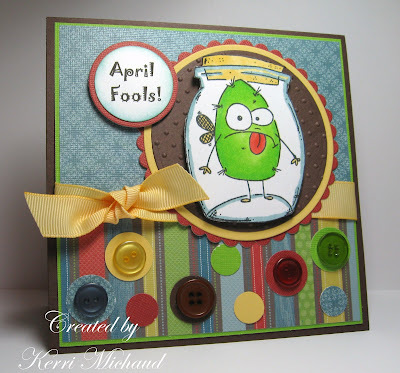 This week, our Fun-Frilled theme was to make an April Fool's Day card. I have no idea what that means, so I just picked a silly image and went with it : ) I used this adorable little guy from Whipper Snapper called Caught A Bug. The sketch is from this week's Sketch Saturday sketch. I colored in the image with Copic markers, cut it out, and popped it up on Circle Nestabilities. The dp is from the DCWV Green Stack. I punched out several circles with circle punches, and layered some buttons on top. I added the ribbon, computer generated the sentiment and it was complete! We hope you'll play along with us, and please check out this post to find out how you can win $282.00 worth of JustRite Stampers products!!! Thanks for stopping by! You're in Florida, you don't get a vacation - every day is a vacation - what the heck!! Have a great Spring Break! Love this card - really cute how you embellished the circle punches with the buttons - too CUTE! Adorable card! Love the buttons you used!!! And the Bug is so cute! Have fun during the Spring Break! Very cute card! I love that paper. I can't seem to get enough of it. I like how you added the buttons. So cute! Love the layout & those buttons. OMG Kerri! What a super adorable and totally fun card! Love the colors and you did a great job on the Sketch Saturday!